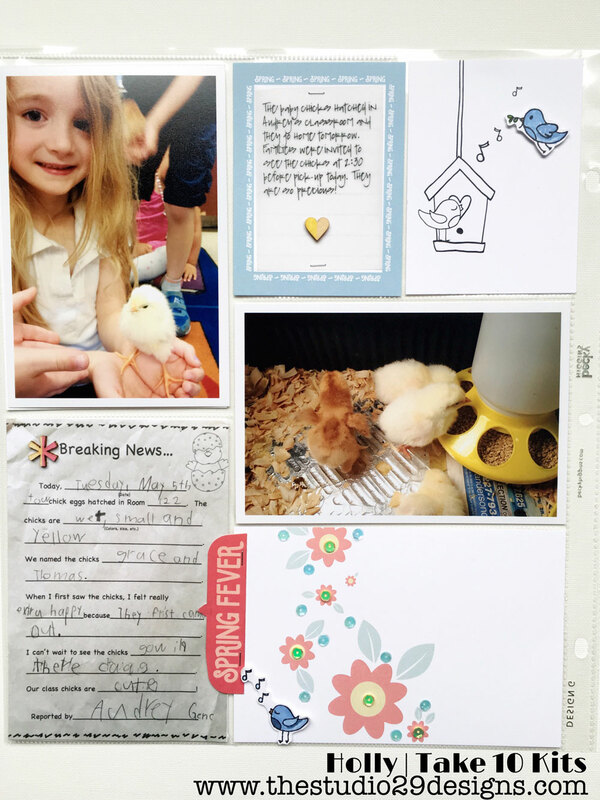 It was such a sweet visit to the kindergarten classroom to meet the baby chicks that hatched. They are so cute and the kids love them and were so gentle with them. It was amazing! The March Take 10 Kit (Pocket Kit and Glam Bag) from Studio 29 Designs was a great match for these pictures. Baby chicks mean spring time to me! I decided to leave a lot of white space on these cards. White space is good. You shouldn't feel like you have to fill in white space when you see it. Give yourself permission to intentionally leave it. I printed my journaling on vellum so you could still see the lines behind. I have a little tutorial I want to share on what I did for printing my journaling from my phone. Go here if you would like to see that! I stamped that little bird on white cardstock so that I could cut it out and use a pop dot for dimension. And there is my pop of color on that black and white card! On my bottom 4x6 card, I had some fun placing sequins throughout the floral design. 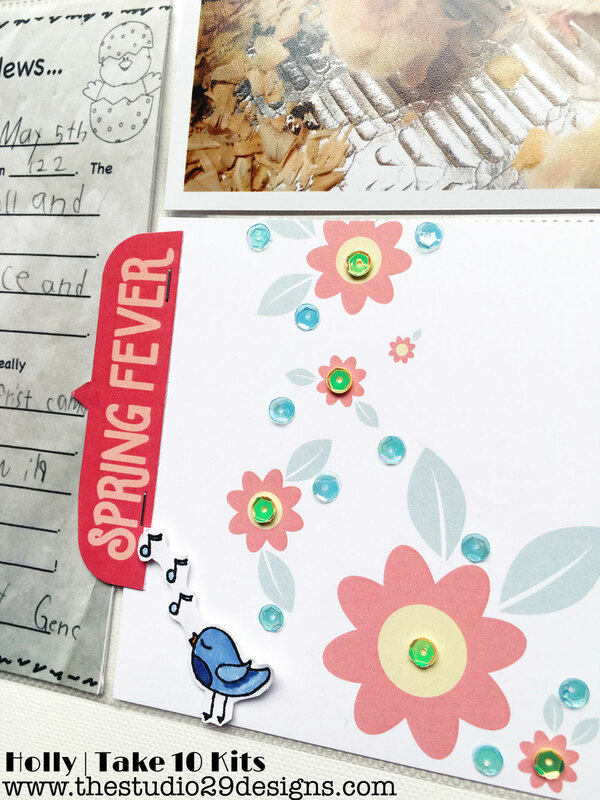 I cut up that "Spring Fever" 3x4 card to make a coordinating tab. (And I can use the other half on a different layout!) I made another little stamped bird for this card, too. For both birds, I got out my Stampin' Up Stamp & Write marker set. I am not a marker coloring guru, but I have watched a few tutorials. I have one tip to share that ANYONE can pull off. It can be done two ways. All I did here was give these critters a wash of a lighter shade of blue and then add a little bit of darker blue for a shadow under the wing. So cute and easy. You don't have to be an expert colorist. 1. Give an all over wash of a lighter color. 2a. Determine where a shadow would naturally be (imagine the sun up and to the left for my birds) and use a slightly darker shade of same color family. 2b. Same idea as 2a, but just use more layers of the same marker you used for the wash to make it darker. That marker set is very versatile. They are double ended (fine point and brush tip). I use them for journalling, stamping, and coloring! If you don't have a Stampin' Up demonstrator, you need one and I've got one for ya. Mary Talbot is one of my besties. She'll hook you up. 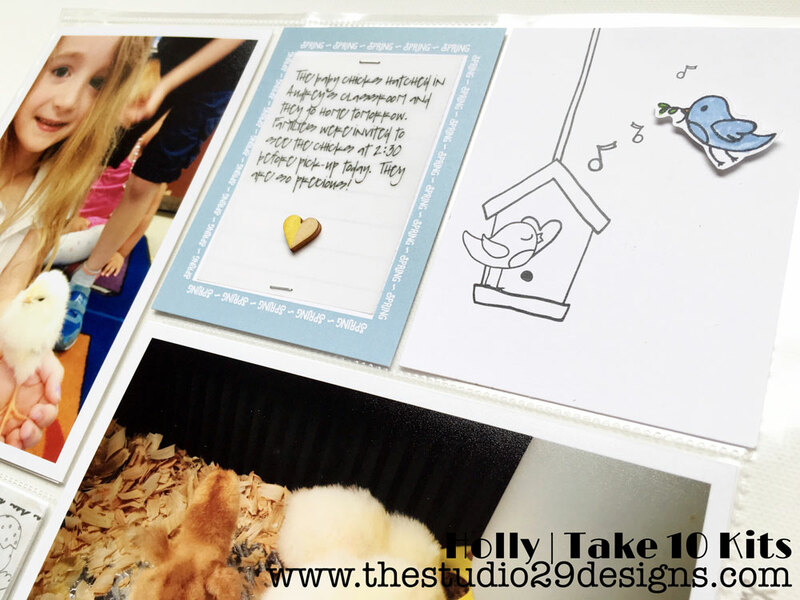 Her site is here: Stampin' Up - Mary Talbot. In case you don't know, they sell exclusive Project Life sets, too. Check it out. 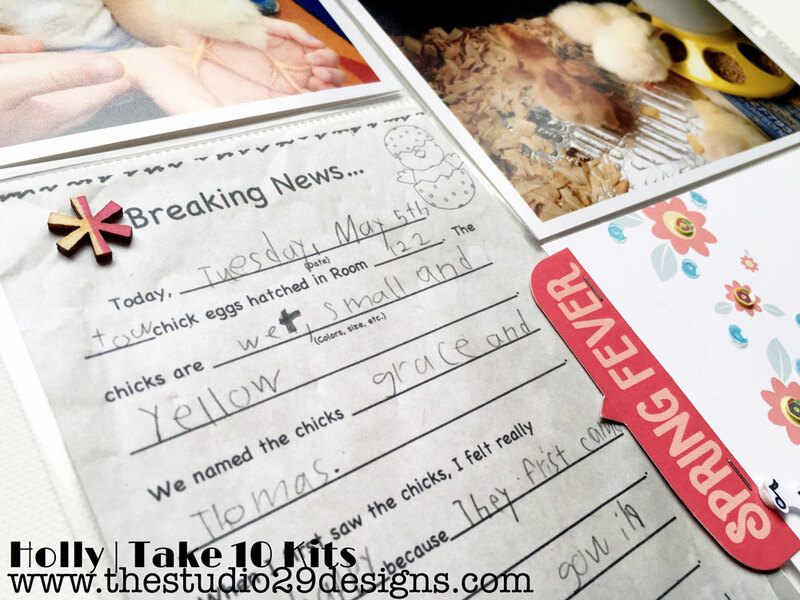 My last detail photo shows a homework sheet that my kindergartner brought home during their study on baby chicks. It is so fun to include with these photos to tell some of the story through her eyes. I just took a photo of it and printed as a 4x6 on cardstock. Go find some baby chicks to visit this spring. They are so fun to observe. Love this, Holly!! Those sequins on the flower card .... Yes!! Your birdies are adorable. I love to color stamps for elements in my scrapbooking. Now if I could just get life to cooperate so I could do more of both! Thanks, Elizabeth! I love this month's birdie theme stamp! It's so cute. I just had to pull out the markers. :) I know about the juggling tricks to sneak in crafty time! !